Åsa Bergman is the President of Sweco Sweden, a role she has successfully carried out since 2012. With 5,600 employees in over 50 locations, the company has almost doubled in size under Åsa’s five years in charge. As a champion of equality, Åsa has transformed Sweco into one of Sweden’s most equal companies, with women holding 50% of top management positions. A remarkable achievement for engineering! From day one, Åsa has considered diversity to be a key factor for success, profitability and growth and she has managed to make this a natural part of the company culture. When Sweden received a large influx of immigrants, Sweco committed to hire or offer internship to 100 newcomers. 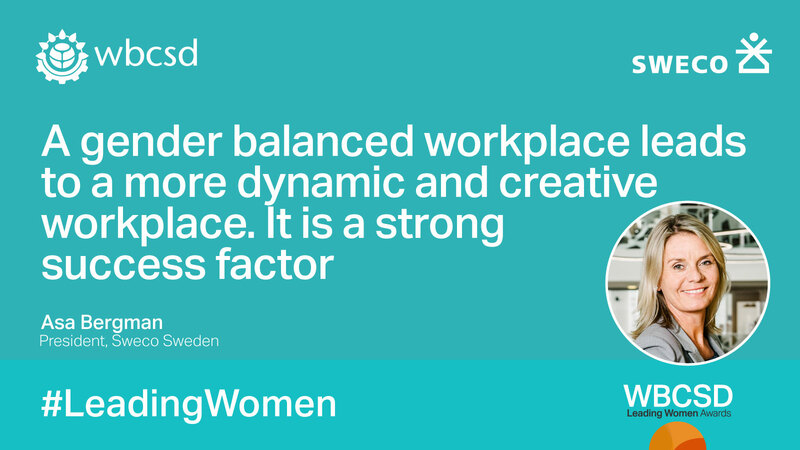 Åsa’s modern, flexible leadership and focus on a good work-life balance makes her a role model for many. She holds an MSc. degree in Civil Engineering from Stockholm’s Royal Institute of Technology and in 2012 was awarded the prestigious prize “Leadership developer of the year” by the Swedish Organisation for Managers, Ledarna. Sweco is Europe’s leading architecture and engineering consultancy, with 14,500 employees and projects in 70 different countries. Every year Sweco is carrying out more than 30,000 projects globally, spanning the wide spectrum of topics covered in the Sustainable Development Goals.